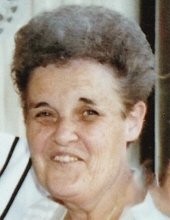 Helen S. (McKay) Grosvenor, 86, of Ludlow, passed away on April 9, 2019 surrounded by her loving family. Born Ludlow, daughter of the late Edward and Elizabeth (MacDonald) McKay, she was a lifelong resident and graduate of Ludlow H.S. In her early years, Helen worked a Sickels company and later as a noon monitor for East St and Veterans Park Elementary Schools. She was a faithful and devoted member of the former St. Mary of the Assumption Church as well as a member of its ladies guild, often affectionately referred to as “the church ladies”, and is currently a member of St. Elizabeth Parish. Helen had a love for her faith, her family, and also for lighthouses. Her house was always an open door and she especially enjoyed hosting Tuesday Night for over 35 years which included the sharing of stories, laughter, and love. Helen was the beloved wife of the late Raymond Grosvenor, who predeceased her in 1995; a loving mother to Kim Kania and husband Paul, Donna Tarullo, and the late Daryl and Paul “Gov” Grosvenor; a cherished grandmother to Sarah and Emily Tarullo, and Elizabeth and Jennifer Kania; a dear sister to John McKay, and the late Edward McKay, Mary “Mae” Duquette, and Elizabeth “Betty” Rodrigues; and also leaves many loving extended family members and dear friends. Funeral services for Helen will be held on Friday, April 12th. Visiting hours will be from 9:30-11:15 in Ludlow Funeral Home with Liturgy of Christian Burial at 12:00pm in St. Elizabeth Parish followed by burial in Island Pond Cemetery. Donations may be made in Helen’s memory to St Jude’s Children’s Research Hospital (stjude.org). To send flowers or a remembrance gift to the family of Helen S. (McKay) Grosvenor, please visit our Tribute Store. "Email Address" would like to share the life celebration of Helen S. (McKay) Grosvenor. Click on the "link" to go to share a favorite memory or leave a condolence message for the family.